And we've touched down here in beautiful downtown Los Angeles. 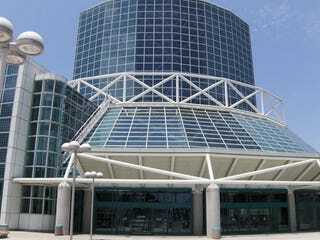 We've registered and snooped around the LA Convention Center, snapping pictures for you to look at. Mmm, nothing like looking at kiosks and furniture. Should give you a vague idea of what tomorrow will be like. A very, very, very vague idea.